This radar view of the Halloween asteroid 2015 TB145 looks hauntingly like a skull ahead of an Oct. 31, 2015 flyby. The asteroid pass safely by Earth at a range of 300,000 miles. The Arecibo Observatory in Puerto Rico captured this view. NASA has called it a "Great Pumpkin." Others have called it "spooky." 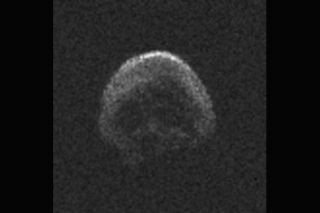 But this image of a huge asteroid making a Halloween flyby of Earth today looks so much like a skull, it's scary. The radar image of the stadium-sized asteroid 2015 TB145 was captured on Friday, Halloween eve (Oct. 30), by scientists using the Arecibo Observatory in Puerto Rico. It shows a haunting view of an asteroid with an uneven surface, with depressions in regions that give it the appearance of a human skull staring out from the void. "The bright and dark features are indication of surface irregularities," James Richardson, a scientist with the Planetary Radar Group of Universities Space Research Association using the Arecibo Observatory, said in a statement. "For example, the central dark feature may be a large circular depression, possibly an impact crater." This series of radar images of the asteroid 2015 TB145 were captured by the Arecibo Observatory in Puerto Rico. They show views of the so-called Halloween asteroid as it rotated during a 40-minute observation ahead of its Oct. 31, 2015 flyby of Earth. Asteroid 2015 TB145 will pass safely by Earth at a range of about 300,000 miles (480,000 kilometers), about 1.3 times the distance between the Earth and the moon. Radar observations of the asteroid have shown it to be larger than expected - it's 1,968.5 feet (600 meters) wide - and rotating once every five hours. The asteroid is speeding through space at 78,293 mph (126,000 km/h) and has shown some signs suggesting it may be a comet. 2015 TB145 was discovered on Oct. 10 by scientists using the University of Hawaii's Pan-STARRS 1 observatory. The flyby is the closest of its kind for such a large asteroid until August 2027, so NASA scientists have been tracking it with radar and optical telescopes to take advantage of such a fortuitous chance to see an asteroid up close. The best images, they say, will come Saturday, once the asteroid makes its closest approach to Earth. "The close approach of 2015 TB145 at about 1.3 times the distance of the moon's orbit, coupled with its size, suggests it will be one of the best asteroids for radar imaging we'll see for several years," said Lance Benner, head of NASA's asteroid radar research program, in a statement. "We plan to test a new capability to obtain radar images with two-meter resolution for the first time and hope to see unprecedented levels of detail." The online Slooh Community Observatory will host a live webcast of asteroid 2015 TB145's flyby at 1 p.m. EDT (1700 GMT) today. You can go to Slooh.com to join and watch this broadcast live, as well as access Slooh's library of past shows. You can also watch the asteroid flyby webcast on Space.com, courtesy of Slooh.